Olivia Johnson ’18 (left) takes a blood-pressure reading at a clinic in Nicaragua. For Colton Wiesner ’16, it was a St. Norbert College international TRIPS journey over the 2014-15 winter break that opened his eyes to the issues facing the medically underserved. “The lack of access to basic medical resources conjured in me a drive to serve both my local and global community, and I wanted to recreate that in a new team of participants,” he says. When Wiesner returned to Nicaragua this January, he and his team came with more than willing hands. Their luggage included 40 new stethoscopes and 40 blood-pressure cuffs to donate to the visited clinics. Wiesner, along with co-leader and fellow biology major Sara Gionet ’16, let powerful impressions from their previous medical-focused TRIPS experiences drive a July 4 fundraiser at Horicon Meats in Gionet’s hometown. The team raised more than $1,400 for the medical supplies. The 10-person student group continued to raise money and collect donations throughout the summer and into the fall. 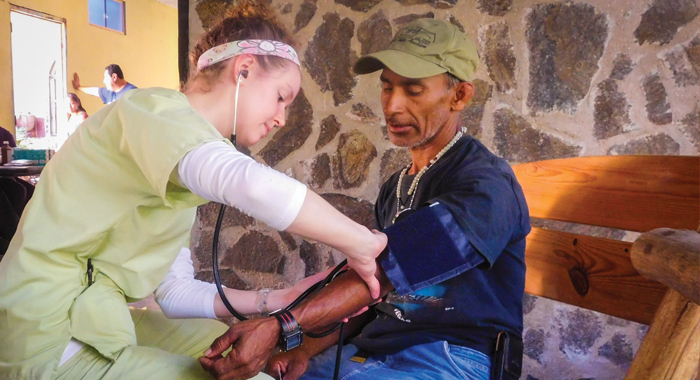 “On the trip, we were able to donate medical supplies totaling over $5,000 in value to the Nicaraguan people, which was among the top three donations that our affiliate service organization, Panorama Service Expeditions, has ever received,” says Wiesner. Wiesner recalls that, in his first visit to Nicaragua in January of 2015, he saw only one child-sized blood-pressure cuff in the entire region of clinics – just one cuff for thousands of patients. On this return visit to the Central American nation, the St. Norbert team worked with local doctors in rural clinics to provide much-needed physician support. Daily duties included taking vitals, dispensing medications, vaccinating, fetching supplies – even holding flashlights at the proper angle for pop-up dental clinics. St. Norbert College will continue to send students to Nicaragua through an International Medical TRIPS initiative developed by the Sturzl Center and Campus Ministry. And with a recent partnership between the college, the Nicaragua Compact and Panorama Service Expeditions, St. Norbert will continue to make an ongoing impact in the San Jose de Cusmapa region. A remote rainforest village in Nicaragua hosted an unforeseen St. Norbert rendezvous two years ago when Mary Harp Jirschele ’76 (right) and her “eyeglass mission” group met up with four students taking part in an alternative break service program.